The Visiting Nurse Association & Hospice is dedicated to providing the highest quality health care to residents of the Central Coast by meeting their individual needs in an ethical, effective, caring and fiscally responsible manner. Our volunteers form a very special part of our interdisciplinary hospice team. Their time, talents and commitment change the lives of the patients and families we serve here in the central coast community! Whether you are providing a service or simply your presence, we guarantee that YOU will make a difference. To learn more about our various volunteer programs within VNA & Hospice, please contact the Volunteer Coordinator today! 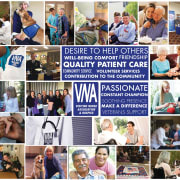 VNA & HOSPICE accepts donations. Donate Now. Would you recommend VNA & HOSPICE?